This Free GNS3 lab is provided to help you gain a better understanding of MPLS and how to configure it in Cisco IOS based routers. We will also review configuration of BGP, OSPF, EIGRP, and RIP routing protocols and the redistribution of these protocols. 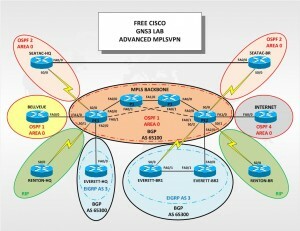 The lab has been created using GNS3 and is based on an older lab with some changes to the MPLS backbone at the provider core. Multiprotocol Label Switching (MPLS) allows Enterprises and Service Providers to construct next-generation intelligent networks that deliver a wide variety of advanced, value-added services over a single infrastructure. This economical solution can be integrated seamlessly over any existing infrastructure, such as IP, Frame Relay, ATM, or Ethernet. Subscribers with differing access links can be aggregated on an MPLS edge without changing their current environments, as MPLS is independent of access technologies. IP-based VPNs use the next-generation Virtual Routing/Forwarding instance (VRF)-Lite, called Easy Virtual Network (EVN). This simplifies Layer 3 network virtualization and allows customers to easily provide traffic separation and path isolation on a shared network infrastructure, removing the need to deploy MPLS in the enterprise network. EVN is fully integrated with traditional MPLS-VPN or MPLS VPN on GRE. Virtual Routing and Forwarding (VRF), allows you to implement multiple routing tables on the same router. Each VRF is independent and could have the same IP subnets being forwarded to completely different destinations. Review basic routing protocol configuration (OSPF, EIGRP, RIP, and BGP). • All SeaTac, Renton, and Everett clients can access Bellevue and the Internet. • BELLEVEUE is running OSPF process 1. • BELLEVEUE has access to all clients except INTERNET. • INTERNET is running OSPF process 4. • SEATAC-HQ and SEATAC-BR is running OSPF process 2 and communicates over a dedicated connection between the sites. • Communication between SeaTac and Renton or Everett is not permitted. • Renton-HQ and BR are running RIP Version 2. • Renton-HQ communicates with Renton-BR but not to SeaTac or Everett. • Everett-HQ communicates with Everett-BR1 and BR2. • Everett-HQ can access Renton-HQ but not vice versa. Nor can Everett-BR1 and BR2 access Renton-HQ or BR. The P1 and P2 provider routers are connected to the PE1 and PE2 provider edge routers as to provide redundancy in the provider core. P1 and P2 provider routers are running in area 0 of OSPF process 1. PE1 and PE2 provider edge routers communicate with connected clients using multiple routing protocols. PE1 and PE2 provider edge routers provide MPLS redistributes of clients routes.